(Leptodactylidae). J Aquat Pollut Toxicol. 2017,1:2. Pesticides are non-selective toxicants that can cause significant mortalities in nontarget species such as amphibian. 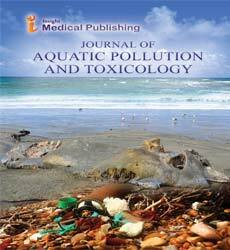 The acute toxicity of three commercial herbicide formulations (Roundup Ultra, Gramoxone Super, Karmex) and three commercial insecticide formulations (Revelo 350CS, Evisect S, BPMC) was determined for larvae of two tropical frog species, Engystomops pustulosus (Leptodactylidae) and Rhinella marina (Bufonidae). The 96 h LC50 for E. pustulosus ranged between 0.3 mg L-1 (Karmex) and 560 mg L-1 (Relevo 350CS) while for R. marinus it ranged between 0.8 mg L-1 (Evisect S) and 280 mg L-1 (Gramoxone Super) following exposure in the aqueous phase alone. Roundup was the only formulation in which LC50 did not vary significantly between the two species. In the presence of soil, the 96 h LC50 for E. pustulosus ranged between 0.8 mg L-1 (Evisect S) and 240 mg L-1 (Relevo 350CS), while the valued for R. marinus ranged between 1.4 mg L-1 (Karmex) and 620 mg L-1 (Relevo 350CS). Engystomops pustulosus was found to be less resistant to the pesticides in the aqueous phase alone, when compared to Rhinella marina. Since both responses varied, lit is unlikely that data collected for anyone species can be used to predict the toxicological responses in another species. Globally,the decline in amphibian population has been linked to several factors,habitat loss,diseases,climate change and pollutants such as pesticides [1-7]. Amphibians are highly susceptible to the effects of chemical because of their biphasic life cycle and permeable skin,which greatly increases the risk of exposure . Various authors have reported on the acute toxic effects of pesticides on amphibian [9-11]. Sayim reported that Malathion had an LC50 value of 29 mg kg-1 to Rana ridubunda . Profenofos,an organophosphate insecticide showed a 96 h LC50 value of 0.58 mg L-1 to Rana spinosa tadpoles . Sparling and Fellers also reported that chlorpyrifos had an LC50 of 365 µg L-1 in P. regilla and 66.5 µg L-1 for R. boylii while endosulfan,had and LC50 of 15.6 µg L-1 for P. regilla and 0.55 µg L-1 for R. boylii . However,effects of some commonly used pesticides in Trinidad and Tobago or the wider Caribbean are unknown for amphibians,especially during the larval stages . Thus,further studies involving the knowledge of the toxicity of different pesticides in a variety of species are urgent and necessary for a better understanding of the risk to this group . Amphibians account for 3.8% of the vertebrates used in toxicity test since 2000,a modest increase from 2.7% for studies between 1972 and 2000 [17,18]. Approximately half of the existing work on amphibians is on Ranidae,although amphibian species are known to differ in sensitivity [19-20]. Information is lacking,in particular,on the ecotoxicology of tropical amphibians,without which interspecies correlation estimation and other predictive models will not be useful for threatened tropical amphibians [21-23]. Therefore examining the acute toxicity of pesticides currently in use (three herbicides and three insecticides) provides valuable information about the potential impacts on amphibians in the Caribbean region. Identifying potential environmental threats can therefore be important in reducing the rate of decline of the species in region. Trinidad and Tobago imports approximately 2000 tons of pesticides annually,with an estimated usage of about 40 tons yr-1 km-2. This gives Trinidad and Tobago an Environmental Vulnerability index score (EVI) scale of 7,which suggest that the country is very vulnerable to impacts from pesticides . Engystomops pustulosus (tungara frog) and Rhinella marina (cane toad) are two native amphibian species widely distributed in Trinidad and Tobago. Tadpoles often inhabit ponds,rivers,and isolated pools which may be contaminated by surface runoff and spray drift from agricultural plots. E. pustulosus produces floating foam nests,from which larvae hatch into the water in a few days,R. marina eggs are laid in strings in water. R. marina was included in this study because toxicological data has been reported in the literature and would allow comparisons to be made with previous work. The other pesticides and amphibian taxon (the tungara frog,Engystomops (Physalaemus) pustulosus,Leptodactylidae) were selected since there was little information available on the ecotoxicology of this tropical family [25,26]. The pesticides chosen for this study were the most commonly sold formulations in Trinidad and Tobago and included Roundup (glyphosate) which has been well reported in the literature . Engystomops pustulosus generally range in length from 30-36 mm and are widely distributed in dry forest,savanna,or grassland in low-lying areas,freshwater marshes,canals,ditches and ponds. Eggs are laid in in foam nests,generally under cover,in pools which prevent desiccation and predation . Tadpoles hatch from eggs and leave the foam nest after about four days. Rhinella marina (Bufonidae) is the largest species in the Bufonidae family. Females are considerably larger than males,attaining a snout-vent length of 15 cm. R. marina is a lowland toad inhabiting areas that are primarily below 1000 m; however altitude appears to be dependent on minimum temperature that the toad can tolerate. Females generally breed between April to September and can produces two clutches of about 8,000 to 35,000 eggs. These are laid in a double strand within a long thin string of gelatinous jelly and hatch within 24 to 72 h of laying,giving rise to tiny,shiny black tadpoles. Female can produce approximately 200,000 eggs during its reproductive life . Foam nests of E. pustulosus were collected from the University of the West Indies Field Station (10°38ʹ14ʺN,61°25ʹ53ʺW) on days after heavy rain and transported individually in polypropylene containers to the laboratory. Nests were placed in 4 L polypropylene containers at 27°C and usually hatched on the second day after collection. Rhinella marina eggs were obtained from adults kept in captivity and induced to spawn by subcutaneous injection of 10 μg luteinizing hormone-releasing hormone [29,30]. Toxicity tests were initiated the day after hatching,when most tadpoles were at Gosner's stage 25 . Each replicate was from a different nest (E. pustulosus) or male-female pairing (R. marina),with a sample size of six replicates for each formulation tested. Static non-renewal toxicity tests using the six pesticides formulations were conducted in 500 mL glass jars washed in 0.1 mol L-1 hydrochloric acid then thoroughly rinses with distilled water . Tadpoles were exposed to both negative (dilution water only) and positive controls (concentration known to cause 100% mortality) and an ascending series of five nominal concentrations of each formulation. Test concentrations were prepared by volumetrically mixing aliquots of a freshly-prepared stock solution with dilution water. An initial log order range-finding test was conducted for each pesticide,to determine and approximate LC50 value so as to better estimate the range of concentrations in the definitive test. The final test ranges used for each of the pesticides. The active ingredients for each pesticide were also determined from the product formulation (Tables 1 and 2). Table 1 Pesticide formulations used in this study, the first three are herbicides, the last three are insecticides. Table 2 Test ranges (mg L-1) of concentrations for the six commercial pesticide formulations used. Toxicity tests were conducted for 96 h at 25°C,pH of 7-8,total alkalinity 45 mg L-1,total hardness 93 mg L-1 and dissolved oxygen >4 mg L-1. Ten tadpoles were used per replicate (from one clutch of eggs) in 300 ml of test solution and six replicates (from separate clutches of eggs) included per test . Tests results were deemed acceptable if the percentage mortality in the negative controls did not exceed 10%. The larvae were fed two pellets (mean pellet mass 18 mg) of Best Flake Cichlid-Gro Pellets (Worldwide Aquatics,Arvin,CA) daily,to eliminate starvation as a cause for mortality and uneaten food was removed . The pellets were moistened in dechlorinated water for E. pustulosus (which is a benthic feeder) prior to use to allow the pellets to sink so that they were more readily available to the tadpoles. The tests were repeated using a soil/water mixture. Soil samples were collected from the University Field Station washed with three changes of distilled water and dried at 110°C for 15 h in a Precision Scientific Thelco laboratory Oven (Artisan Technology Group,Champaign II). Five grams of soil was added to each glass jar (washed as described in the single phase testing) followed by 300 ml of pesticide mixture of the particular concentration (single phase concentrations). The mixture was stirred for 1 h and allowed to settle before the addition of the larvae. Six replicate chambers each with ten tadpoles (determined to be acceptable crowding levels) were used for each test concentration and negative and positive controls. The 96 h LC50 values were determined from the mortality data using Trimmed Spearman analysis. ANOVA and TUKEY HSD analysis (SYSTAT Ver. 5.0) was used to determine whether there was a significant difference (95%) between the LC50 values obtained for the two species. An interspecies toxicity was performed using Model II least squares methodology to determine the relative sensitivities of the two species to the different chemicals. In addition a ‘Resistance Factor’ (RF) (LC50sp1/LC50sp2) was calculated for the various chemicals. Comparative analysis of toxicity of the selected pesticides used standard literature searches and the PAN pesticide database. Amphibian taxonomy was adjusted to current usage where necessary. The 96 h LC50 for E. pustulosus ranged between 0.3 mg L-1 (Karmex) and 560 mg L-1 (Relevo 350CS) while for R. marinus it ranged between 0.8 mg L-1 (Evisect S) and 280 mg L-1 (Gramoxone Super) following exposure in the aqueous phase alone. Subsequent analysis used the equivalent pesticide (active ingredient,AI) concentration of each formulation. There was substantial variation in the sensitivity of the two species between the six pesticides. The pesticides generally showed higher toxicity to E. pustulosus when compared to R. marinus following exposure in both the aqueous phase and soil/water mixture. This would suggest that E. pustulosus may be more sensitive to the effects of pesticides than R. marinus. Relevo 350CS proved to be the least toxic to both species while Karmex and Evisect S were the most toxic in both test regimes (Table 3). Table 3 Mean 96 h LC50 values (mg L-1) for exposure in the aqueous phase alone. The 96 h LC50 for the soil/water mixture for E. pustulosus ranged from 0.3 mg L-1 (Karmex) to 240 mg L-1 (Relevo 350CS) whereas for R. marinus values ranges from 1.4 mg L-1 (Karmex) to 620 mg L-1 (Relevo 350CS). These results suggest that the presence of soil had a significant effect on the toxicity of some of the pesticides. Three of the pesticides,Relevo 350CS,Roundup Ultra and Evisect S showed a significant increase (P<0.05) in toxicity to E. pustulosus in the presence of soil. However,for R. marinus the presence of soil resulted in a significant (P<0.05) decrease in toxicity of most of the pesticides (Tables 3 and 4). Table 4Mean 96 h LC50 values (mg L-1) for exposure in the soil/water mixture. Relevo 350CS has a high water solubility (5.14 × 102 mg kg-1 at 20°C and pH 7) and low soil organic carbon-water partitioning coefficient (Koc=132-310) which means it would favour the aqueous phase. However in the presence of soil the toxicity to E. pustulosus increased but decreased for R. marinus. Cox et al. reported that as the organic and clay content in soils increased there was an increase in the strength of adsorption of Relevo 350CS to the soil which may increase its bioavailability to E. pustulosus. Tadpoles of the genus Physalaemus are exotrophic and larvae feed on materials rasped from submerged surfaces [36,37]. Increased adsorption on soil particles would decrease the overall concentration in the aquatic phase,and consequently the amount that is bioavailable to R. marinus which generally feeds at the surface of the water. Roundup Ultra showed increased toxicity to E. pustulosus and reduced toxicity to R. marinus in the soil/water test. Roundup Ultra has a high Koc value (24000 ml/g) and is therefore rapidly and tightly adsorbed to soil particle and organic matter. Evisect showed a similar increased toxicity to E. pustulosus in the presence of soil. Evisect is a white powder with a low Koc value (20 ml/g) and a low solubility (84000 ppm) which suggests that has low water solubility and high mobility in soils. Evisect has previously been reported to adsorb readily onto soil increasing its toxicity to the bog frog (Rana limnocharis) and tadpoles . The toxicity of the BPMC,Gramoxone and Karmex showed some variability with the addition of soil,however,this was not significant. BPMC is very soluble in water and therefore remains in the aqueous phase. Gramoxone showed a significant (P<0.05) reduction in toxicity to R. marinus in the soil/water mixture. Gramoxone also readily binds to soils with high clay contents and becomes inactivated,showing no residual soil activity. Eisler reported that Gramoxone is quickly removed from the water phase with approximately 50% loss in 36 h in freshwater systems . However,feeding on gramoxone contaminated soils and food can still result is significantly high mortalities as seen with E. pustulosus . The toxicity of gramoxone was significantly higher (P<0.05) for E. pustulosus than R. marinus (Tables 3 and 4). There was no difference in the toxicity of Roundup Ultra to the two species following exposure in the aqueous phase. However there was a decrease in toxicity to R. marinus in the presence of the soil. Glyphosate pesticides such as roundup are one of the most-studied groups in relation to effects on amphibians and other non-target species. This is reflected in an analysis of the available data on the toxicity of commercial glyphosate formulations to larval amphibians. This analysis included 13 studies in which a total of 35 species of 10 families and two orders were tested from 24 h to 16 d exposure; a few observations at other time periods (6 h,12 h,and 72 h) have been excluded from this compilation. The results show a variation in the toxicity of glyphosate formulations among species and over an extended time period from 1-16 days,with most LC50 values within a one order of magnitude 0.5-5.0 mg AI/L,typical of the results found in this study (Table 5 and Figure 1). *Recalculated from mg AI L-1. 4 d values in parentheses were estimated by interpolation or extrapolation, as described in the text. Table 5 Comparative toxicity data (LC50, mg AI L-1) for amphibian larvae to glyphosate formulations. Figure 1: The slow decrease in LC50 for glyphosate formulations with increasing exposure time from 1-16 days, both log scales. The regression equation is log LC50=0.519-0.385 log Days. Regression F1,81=27.4, P < 0.001, r2 adj=24.2%. The slope corresponds to a decrease of LC50 by a factor of 0.77 for a doubled exposure time. The variation of toxicity of glyphosate formulations with exposure time corresponds to an approximate increase of toxicity of about 30% with each doubling of time. More data was available for 96 h than any other exposure period,so it was used in an assessment of variation among families and orders (Table 5). Each species was only considered once in this analysis,where there were two or more values for a species at 96 h,the mean value was used. The mean (± S.D.) log LC50 for the 35 species was 0.302 ± 0.235,equivalent to a mean LC50 of 2.0 mg AI L-1. There was no significant difference (P>0.05) between the two orders (one-way ANOVA of log LC50,F1,33=1.42,P=0.24),or among the ten families represented (F9,25=1.57,P=0.18). Egea-Serrano et al  also found no significant effect (P>0.05) of family (n=8) or of developmental stage (embryo or larva),on survival in a meta-analysis of 48 studies on amphibian ecotoxicology,but showed a significant effect (P<0.05) of pollutant type (with pesticides as a single category). In contrast Hammond et al. did find significant phylogenetic variation among amphibians in sensitivity to a single pesticide (the insecticide endosulfan) . We conclude that amphibians show no overall phylogenetic variation in sensitivity to pollutants,but they do show interspecific differences to some (but not all) pesticides. The lack of variation in toxicity of glyphosate formulations to amphibians should not lead to complacency in estimating the possible effects of pesticides on other species,however,as much greater variation was found in the other pesticides examined in this study. Though glyphosate pesticides (Roundup Ultra) are extensively studies,much less information is available about the toxicity of the other five formulations (BPMC,Gramoxone,Karmex,Revelo 350CS and Evisect S) to amphibians. There was insufficient data to examine variation of toxicity values among studies of the same species,within families or orders (indeed,only one order has been tested,anurans). It is possible,however,to quantify the variability of data for each pesticide,as an assessment of the need for further study and the reliability of extrapolation to unstudied,threatened taxa. This can be some using an appropriate safety factor which take account of the variation in sensitivity between species because we do not know whether the test species is the most sensitive one  (Table 6). A useful measure of the variability of toxicity is the standard deviation of the log transformed observed data (excluding interpolations and extrapolations),as shown in Table 7. For glyphosate formulations the mean log LC50 (of 83 values) was 0.297,similar to the inter-species mean given above (0.302). The S.D. was greater than for the inter-species results (0.282 vs. 0.235),an increase of variability of about 11%,due to the addition of a range of time periods. The variability of the other pesticides can be compared with those for glyphosate using a variance ratio test (i.e.,rather than an ANOVA comparing means,as shown in table) (Table 7) . The variability of the data for imidacloprid was not significantly different (P>0.05) to that from glyphosate,as would be predicted from inspection of the data in Table 6. The results of the only other study of this insecticide on amphibians were for two species of Ranidae,and were similar to those reported in this study . Feng et al. used technical grade imidacloprid rather than a commercial formulation,suggesting that the toxicity is largely due to the pesticide itself. Nevertheless,Puglis and Boone did find significant differences between technical grade and a commercial formulation of imidacloprid (19-150 mg AI L-1) in effects on Rana clamitans larvae,however,no LC50 values were reported . Table 6 Comparative toxicity data (LC50, mg AI L-1) for amphibian larvae to the other five pesticides used in this study. The mean value is shown if >1 value was reported in a single study. The other four formulations (BPMC,Gramoxone,Karmex and Evisect S) were all significantly (P<0.05) more variable than glyphosate in their toxicity to amphibians. Paraquat has a longer history of use than the other pesticides,but still ranks in the top 25 in current use in the USA [47,48]. It had the greatest variability of effect on amphibians (variance ratio>8). Toxicity to R. marina was similar to that of other species studied,with the LC50 at the upper end of the reported range,207 mg/L at 24 h,compared to 320 and 204 mg/L for Adelotus brevis and Limnodynastes peronii,interestingly both members of the rarely-studied family Myobatrachidae. In contrast toxicity to the Leptodactylid E. pustulosus was greater than to any other amphibian studied. These results suggest that taxonomic variation of the effects of paraquat may be important in amphibians (Tables 6 and 7). Table 7: Variability of LC50 for pesticides (data from Tables 5 and 6) and variance ratio test comparing the variability with that of glyphosate. Toxicity of (Karmex) diuron to amphibians is also apparently highly variable,although based on only two studies. Schuytema and Nebeker  reported much lower toxicity of diuron to amphibians than found here,although their study used technical grade pesticide,suggesting that additives in commercial formulations may be important in toxicity,as in glyphosate. Toxicity of thiocyclam and fenobucarb is also rather variable,although the only other reported values were obtained from the PAN pesticides database and original studies could not be located. For both these pesticides values of LC50 found here were above those reported previously (for two species of Ranidae),although not markedly so. We conclude that further data are required to assess the toxicity of all five pesticides and that work on these is more critical than further study of glyphosate [49-51]. A comparison of the Resistance factors (RF) derived from the ratio of the 96 h LC50 between the two species is given in Table 8 . A RF>1 indicates that the species 1 is more resistant to the toxicant than species 2,while a value <1 indicates that the first species was less resistant than the second to toxicant. For E. pustulosus and R. marinus the RF ranged between <0.01 and 4.13 which suggests that in the aqueous phase,E. pustulosus was more sensitive to four of the six pesticides tested. However for the soil/water test,the RF ranged between <0.01 and 0.38 which suggests that the soil had a greater effect of increasing the toxicity of the pesticide to E. pustulosus which was then more sensitive to all six pesticides (Table 8) [53-58]. Table 8: Resistance factors for both species following pesticide exposure under two conditions, aqueous phase and soil/water test (Species 1 PP*/Species 2 BM*). The interspecies toxicity performed between the two species for both the aqueous phase and the soil/water test gave an R2 value of 21 for the aqueous phase while for the soil/water test the value was 0.50 [59-61]. Although there was a positive correlation in both the aqueous phase and the soil/water mixture,the low values of R2 show that the relative sensitivity to the six pesticides differed between the two species [62-66]. There were complex interactions between species,type of pesticide,and environment (presence or absence of soil) among these data . It suggests that both species show different responses and it is unlikely that data collected for anyone species can be used to predict toxicological responses in the other (Figures 2 and 3). Figure 2: Interspecies correlation for Physalaemus pustulosus and Bufo marinus exposed in the aqueous phase. 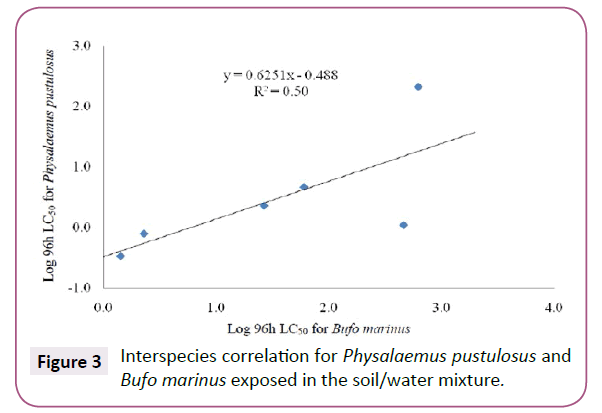 Figure 3: Interspecies correlation for Physalaemus pustulosus and Bufo marinus exposed in the soil/water mixture. The toxicity of roundup to E. pustulosus and R. marinus were similar to those reported for other amphibian species. However gramoxone proved to be more toxic that other amphibians reported in the literature. Soil mixtures also increased the toxicity of the pesticides to E. pustulosus when compared to R. marinus. Responses of both species also differ,and it is unlikely toxicological data for one species can be used to predict responses in the other. Linder G,Krest SK,Sparling DW (Eds) (2003) Amphibian decline: An integrated analysis of multiple stressor effects. Pensacola,FL: SETAC. Wake DB,Vredenburg VT (2008) Are we in the midst of the sixth mass extinction? A view from the world of amphibians. PNAS 105: 11466-11473. Alford RA,Richards SJ (1999) Global amphibian declines: A problem in applied ecology. Annu Rev Ecol Evol Syst30: 133-165. Berger L,Speare R,Daszak P,Green DE,Cunningham AA,et al. (1998) Chytridiomycosis causes amphibian mortality associated with population declines in the rain forests of Australia and Central America. Proc Natl Acad Sci95: 9031-9036. Davidson C,Shaffer HB,Jennings MR (2001) Declines of the California red-legged frog: Climate,UV-B,habitat and pesticides hypotheses. Ecol Appl 11: 464-479. Cowman DF,Mazanti LE (2000) Ecotoxicology of Ã¢ÂÂnew generationÃ¢ÂÂ pesticides to amphibians. In: Sparling DW,Bishop CA,Linder G (Eds),Ecotoxicology of amphibians and reptiles. Pensacola,FL: SETAC: 233-268. Davidson C,Knapp RA (2007) Multiple stressors and amphibian declines: Dual impacts of pesticides and fish on yellow-legged frogs. Ecol Appl 17: 587-597. Quaranta A,Bellantuono V,Cassano G,Lippe C (2009) Why amphibians are more sensitive than mammals to xenobiotics. PLoS ONE 4: e7699. Johansson M,Piha H,Kylin H,Merila J (2006) Toxicology of six pesticides to common frog (Rana Temporaria) Tadpoles. Environ Toxicol Chem 12: 3164-3170. Ouellet M,Bonin J,Rodrigue J,Desgranges JL,Lair S (1997) Hindlimb deformities (ectromelia,ectrodactyly) in free-living anurans from agricultural habitats. J Wildl Dis33: 95-104. Sparling DW,Fellers GM,McConnell LL (2001) Pesticides and amphibian population declines in California,USA. Environ Toxicol Chem 20: 1591-1595. Sayim F (2007) Acute toxic effects of malathion on the 21st stage larvae of the marsh frog. Turk J Zool 32: 99-106. Li X,Li S,Liu S,Zhu G (2010) Lethal effect and in vivo genotoxicity of profenofos to Chinese native amphibian (Rana spinosa) tadpoles. Arch. Environ Contam Toxicol 59: 478-483. Sparling DW,Fellers GM,(2009) Toxicity of two insecticides to California,USA,anurans and its relevance to declining amphibian populations. Environ Toxicol Chem 28: 1696-1703. Lehman CM,Williams BK (2010) Effects of current-use pesticides on amphibians. In: Sparling DW,Linder G,Bishop CA,Krest SK (Eds),Ecotoxicology of amphibians and reptiles,2nd edition,Boca Raton: CRC Press,pp: 167-202. Sparling DW,Linder G,Bishop CA,Krest SK (2010) Recent advancements in amphibian and reptile ecotoxicology. In: Sparling DW,Linder G,Bishop CA,Krest SK (Eds),Ecotoxicology of amphibians and reptiles,2nd edition Boca Raton: CRC Press,pp: 1-11. Sparling DW,Bishop CA,Linder G (2000) The current status of amphibian and reptile ecotoxicological research. In: Sparling DW,Bishop CA,Linder G (Eds),Ecotoxicology of amphibians and reptiles. Pensacola,FL: SETAC,pp: 1-13. Bridges CM,Semlitsch RD (2000) Variation in pesticide tolerance of tadpoles among and within species of Ranidae and patterns of amphibian decline. Conserv Biol 14: 1490-1499. Boone MD,Davidson C,Bridges-Britton C (2009) Evaluating the impact of pesticides in amphibian declines. In: Heatwole H and Williamson J (Eds),Amphibian decline: Diseases,parasites,maladies and pollution. Amphibian Biol 8: 3186-3207. Hailey A,Cazabon-Mannette M (2011) Conservation of herpetofauna in the Republic of Trinidad and Tobago. In: Hailey A,Wilson BS,Horrocks JA (Eds),Conservation of Caribbean island herpetofaunas,Conservation biology and the wider Caribbean Leiden. Brill 1: 183-217. Awkerman JA,Raimondo S,Barron MG (2008) Development of species sensitivity distributions for wildlife using interspecies toxicity correlation models. Environ Sci Technol 42: 3447-3452. Raimondo S,Jackson CR,Barron MG (2010) Influence of taxonomic relatedness and chemical mode of action in acute interspecies estimation models for aquatic species. Environ Sci Technol 44: 7711-7716. Agard JBR,Gowrie M (2003) Environmental Vulnerability Index (EVI): Provisional indices and profiles for Trinidad and Tobago. State of the Environment Report 2001 and 2002. Environmental Management Authority. Izaguirre MF,Lajmanovich RC,Peltzer PM,Soler AP,Casco VH (2000) Cypermethrin-induced apoptosis in the telencephalon of Physalaemus biligonigerus tadpoles (Anura: Leptodactylidae). Bull Environ Contam Toxicol 65: 501-507. Pereira LMP,Boysielal K,Siung-Chang (2007) A Pesticide regulation,utilization and retailersÃ¢ÂÂ selling practices in Trinidad and Tobago,West Indies: Current situation and needed changes. Rev Panam Salud Publica. 22: 83-90. Marsh DM,Fegraus EH,Harrison S (1999) Effects of breeding pond isolation on the spatial and temporal dynamics of pond use by the Tungara Frog, Physalaemus pustulosus.J Anim Ecol 68: 804-814. Page A,Kirkpatrick W,Massam M (2008) Risk assessments for exotic reptiles and amphibians introduced to Australia-Cane toad (Bufo marinus) (Linnaeus,1758) Department of Agriculture and Food,Western Australia. McDiarmid RW,Altig R (1999) Research materials and techniques. In: McDiarmid RW,Altig R (Eds),Tadpoles: The biology of anuran larvae Chicago. University of Chicago Press,pp: 7-23. Tyler MJ (1999) Frogs and toads as experimental animals. ANZCCART News 12: 1-4. Gosner KL (1960) A simplified table for staging anuran embryos and larvae with notes on identification. Herpetologica 16: 183-190. ASTM E729-96 (2014) Standard guide for conducting acute toxicity tests on test materials with fishes,macroinvertebrates and amphibians,ASTM International. Sookoo NJ (2012) Toxicology of pesticides on the larvae of two tropical amphibians,Physalaemus pustulosus and Bufo marinus. M.Phil. thesis,St. Augustine,Trinidad: The University of the West Indies. Hailey A,Sookoo N,Mohammed A,Khan A (2006) Factors affecting tadpole growth: Development of a rearing system for the Neotropical leptodactylid Physalaemus pustulosus for ecotoxicological studies. Appl Herpetol3: 111-128. Mullins JW (1993) Imidacloprid: A new nitroguanidine insecticide. In: Duke SO,Menn JJ,Plimmer JR (Eds),Pest control with enhanced environmental safety,American Chemical Society,Symposium Series 524: 183-198. Cox L,Koskinen W,Yen P (1997) Sorption-desorption of imidacloprid and its metabolites in soils. J Agric Food Chem 45: 1468-1472. Altig R,Johnston GF (1989) Guilds of anuran larvae: Relationships among developmental modes,morphologies and habitats. Herpetol Monogr 3: 81-109. Pan,D,Xueming L (1993) Safety study of pesticides on bog frog,a predatory natural enemy of pest in paddy field. J Hunan Agric Coll 19: 47-54. Eisler R (1990) Paraquat hazards to fish,wildlife,and invertebrates: A synoptic review. Biological Report No. 85 (1.22). Laurel,MD: Patuxent Wildlife Research Center. Dial CAB,Dial NA (1995) Lethal effects of the consumption of field levels of paraquat-contaminated plants on frog tadpoles. Bull Environ Contam Toxicol 55: 870-877. Egea-Serrano A,Relyea RA,Tejedo M,Torralva M (2012) Understanding of the impact of chemicals on amphibians: A meta-analytic review. Ecol Evol 2: 1382-1397. Hammond JI,Jones DK,Stephens PR,Relyea RA (2012) Phylogeny meets ecotoxicology: Evolutionary patterns of sensitivity to a common insecticide. Evol Appl 5: 593-606. Luttik R,Aldenberg T (1997) Extrapolation factors for small samples of pesticide toxicity data: Special focus on LD50 values for birds and mammals. Environ Toxicol Chem 16: 1785-1788. Zar JH (1999) Biostatistical analysis,4th edition. Upper Saddle River,NJ: Prentice Hall. Feng S,Kong Z,Wang X,Zhao L,Peng P (2004) Acute toxicity of two novel pesticides on amphibian,Rana N Hallowell. Chemosphere 56: 457-463. Puglis HJ,Boone MD (2011) Effects of technical-grade active ingredient vs commercial formulation of seven pesticides in the presence or absence of UV radiation on survival of green frog tadpoles. Arch Environ Contam Toxicol 60: 145-155. Eisler R (1990) Paraquat hazards to fish,wildlife and invertebrates: A synoptic review. Biological Report No. 85 (1.22). Laurel,MD: Patuxent Wildlife Research Center. Grube A,Donaldson D,Kiely T,Wu L (2011) Pesticides industry sales and usage: 2006 and 2007 market estimates. Office of Chemical Safety and Pollution Prevention,US Environmental Protection Agency. Schuytema GS,Nebeker AV (1998) Comparative toxicity of diuron on survival and growth of Pacific treefrog,bullfrog,red-legged frog,and African clawed frog embryos and tadpoles. Arch Environ Contam Toxicol 34: 370-376. Mann RM,Bidwell JR (1999) The toxicity of glyphosate and several glyphosate formulations to four species of south-western Australian frogs. Arch Environ Contam Toxicol 36: 193-199. Mann RM,Hyne RV,Choung CB,Wilson SP (2009) Amphibians and agricultural chemicals: Review of the risks in a complex environment. Environ Pollut 157: 2903-2927. Mohammed A,Halfhide T,Elias-Samlalsingh N (2009) Comparative sensitivity of three life stages of the tropical mysid,Metamysidopsis insularis to six toxicants. Toxicol Environ Chem 91: 1331-1337. Relyea RA,Jones DK (2009) The toxicity of Roundup Original MaxÃÂ to 13 species of larval amphibians. Environ Toxicol Chem 28: 2004-2008. King JJ,Wagner RS (2010) Toxic effects of the herbicide RoundupÃÂ regular on Pacific north-western amphibians. Northwest Nat 91: 318-324. Edgington AN,Sheridan PM,Stephenson GR,Thompson DG,Boermans HJ (2004) Comparative effects of pH and VisionÃÂ herbicide on two life stages of four anuran amphibian species. Environ Toxicol Chem 23: 815-822. Howe CM,Berrill M,Pauli BD,Helbing CC,Werry K,et al. (2004) Toxicity of glyphosate-based pesticides to four North American frog species. Environ Toxicol Chem 23: 1928-1938. Relyea RA (2005) The lethal impacts of Roundup and predatory stress on six species of North American tadpoles. Arch Environ Contam Toxicol 48: 351-357. Fuentes L,Moore LJ,Rodgers JH,Bowerman WW,Yarrow GK,et al. (2011) Comparative toxicity of two glyphosate formulations (original formulation of RoundupÃÂ and Roundup WeathermaxÃÂ) to six North American larval anurans. Environ Toxicol Chem 30: 2756-2761. Lajmanovich RC,Attademo AM,Peltzer PM,Junges CM,Cabagna MC (2011) Toxicity of four herbicide formulations with glyphosate on Rhinella arenarum (Anura: Bufonidae) tadpoles: B-esterases and glutathione S-transferase inhibitors. Arch Environ Contam Toxicol 60: 681-689. Bernal MH,Solomon KR,Carrasquilla G (2009) Toxicity of formulated glyphosate (Glyphos) and Cosmo-Flux to larval Colombian frogs 1. Laboratory acute toxicity. J Toxicol Environ Health A 72: 961-965. Yadav SS,Giri S,Singha U,Boro F,Giri A (2013) Toxic and genotoxic effects of roundup on tadpoles of the Indian skittering frog (Euflictis cyanophlyctis) in the presence and absence of predator stress. Aquatic Toxicol 132: 1-8. Jones DK,Hammond JI,Relyea RA (2011) Competitive stress can make the herbicide roundupÃÂ more deadly to larval amphibians. Environ Toxicol Chem 30: 446-454. Lajmanovich RC,Sandoval MT,Peltzer PM (2003) Induction of mortality and malformation in Scinax nasicus tadpoles exposed to glyphosate formulations. Bull Environ Contam Toxicol 70: 612-618. Johnson CR (1976) Herbicide toxicities in some Australian anurans and the effect of sub-acute dosages on temperature tolerance. Zool J Linn Soc 59: 79-83. Sanders HO (1970) Pesticide toxicities to tadpoles of the western chorus frog Pseudacris triseriata and FowlerÃ¢ÂÂs toad Bufo woodhousii fowleri. Copeia 1970: 246-251. Yin XH,Li SN,Zhang L,Zhu GN,Zhuang HS (2008) Evaluation of DNA damage in Chinese toad (Bufo bufo gargarizans) after in vivo exposure to sub-lethal concentrations of four herbicides using the comet assay. Ecotoxicol 17: 280-286. Linder G,Barbitta J,Kwaiser T (1990) Short-term amphibian toxicity tests and paraquat toxicity assessment. In: Landis WG and van der Schalie WH (Eds),Aquatic toxicology and risk assessment: ASTM STP 1096. Philadelphia: American Society for Testing and Materials. 189-198. Lajmanovich,Izaguirre MF,Casco VH (1998) Paraquat tolerance and alteration of internal gill structure of Scinax nasica tadpoles (Anura: Hylidae). Arch Environ Contam Toxicol 34: 364-369.